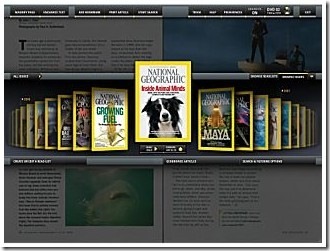 I have been a huge fan of the National Geographic magazine for as long as I can remember and subscribe to it. National Geographic has released an wickedly cool collection of their magazines since 1888 in a 160GB hard drive. Explore 120 years of amazing discoveries, fascinating maps, and the world’s best photography with The Complete National Geographic. This definitive collection of every issue of National Geographic magazine, digitally reproduced in stunning high resolution, brings you the world and all that is in it. Use the advanced interface to explore a topic, search for photographs, browse the globe, or wander on your own expedition. Access all of the maps, photos, and magazine issues found on the DVD collection in one external hard drive. Browse and search the entire collection without needing to swap out DVDs. Lightweight and travel-friendly, the hard drive is just 3″ x 5″ and requires only a USB connection. We’ve left plenty of hard disk space to accommodate future upgrades. We’ve also allocated approximately 90GB of hard disk space for your own personal use. This is absolutely an incredible collection of the best nature content in the world in digital format. In fact, the hard drive comes with 100GB of free space for future updates. If you are interested in nature photography tips, there couldn’t be a better collection of some of the best nature photographs around! 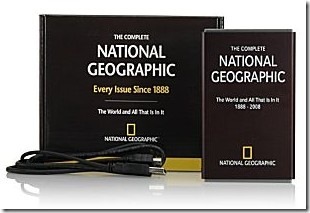 You can also get this in a set of 6 DVDs and current National Geographic customers get a price break too. That is really cool. I would love to get all those National Geographics. Thanks for the heads up on the digital format. wow, I had no idea NatGeo had been around for so long. It would be fascinating to see the 1800’s stuff.